Make the Rice - Rinse the rice until water runs clear. Put the rice into a pot with the water and bring to a simmer. Cover and turn to low for 10 minutes. Remove from heat and let sit 15 more minutes. In a new bowl, add the vinegar, sugar, salt, and cooked rice and toss with a spoon until it cools to room temperature. Prep the Fillings - Thinly slice the carrots and celery. Cook the chicken and shred it into very small pieces. Mix the chicken with the cayenne sauce and mayo. If it's too dry, add more sauce, but make sure it isn't too juicy or it will leak through the rice! Also cut nori into thin strips. Make the Roll! - On a sushi roller, place the nori. Put several strips vertical, and one strip horizontal in the center. 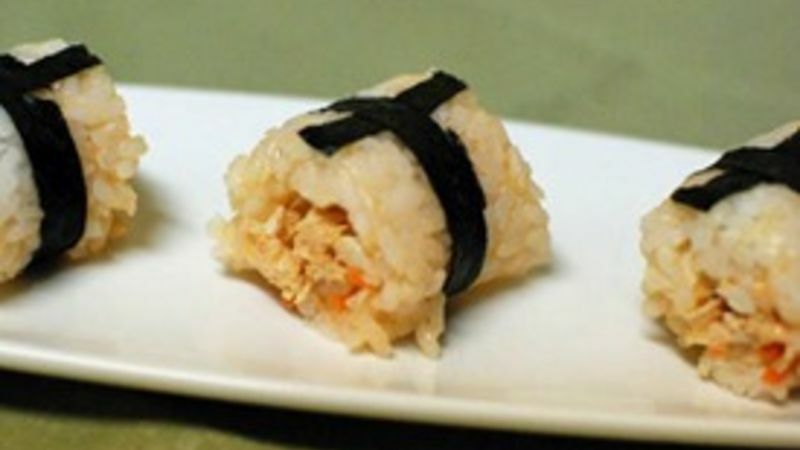 Press out a thin layer of rice over the nori strips. Put your fillings on the rice and roll it up! Slice the rolls in between the vertical strips so that each roll has a cross on it that looks like it has been gift wrapped. Serve blue cheese dressing on the side to dip in.